The first drawing where i realized, "I can do this." Wow, that’s very impressive! You’re very talented…. I said the same thing, riding an elephant, by myself, the first time I took a vacation alone. I went to Thailand. What an amazing feeling that is, too! Your work is beautiful, and it’s wonderful to see its evolution here. Thanks for following me! Wow if that’s your first sketch, then I’m impressed. I’m also an illustrator, though you probably would not ever know that from my blog (and thanks for the follow btw!!). I started drawing animals when I was around 7 or 8 and I got pretty good. For some reason I liked Tapirs, go figure. I majored in design and illustration but unfortunately I don’t do that for a living. I think I’m getting out the pencils again! If I draw anything remotely “ok” I will post it for your critique!! 🙂 Keep drawing! You can so do this alright! I can’t believe it that this is your 1st drawing?! Besides doodles as a kid, (i still stink at doodling btw) yes, it was my first drawing. I am surprised I still have it, actually. It was a drawn elephant on a greeting card, that i don’t think i have. I don’t know why I chose a drawing to draw, because i never re-draw art. Anyway, I believe I was MIA in my teenage summer activities because I had stepped on a nail or glass… both happened just dont really remember which one I was bored enough to attempt this. Thats how it all started! 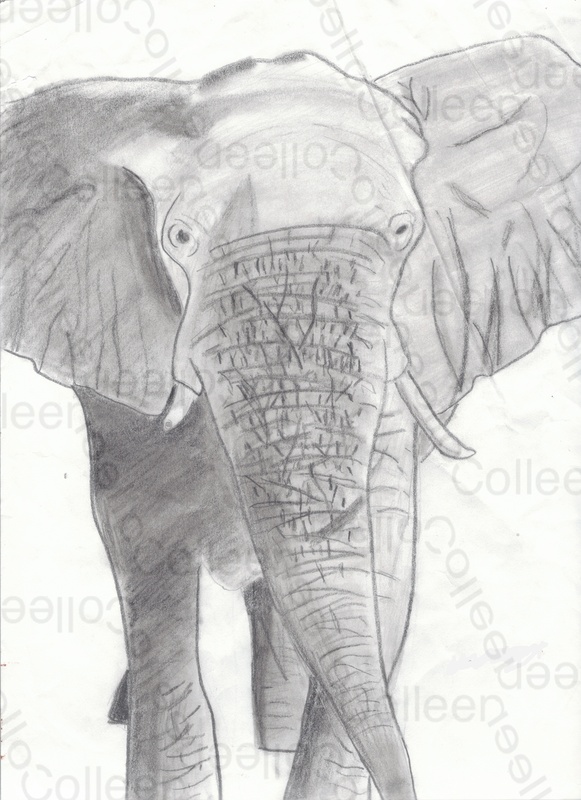 Your first drawing, I yes you can and yes you did – your work is amzingly crafted with intention – it shows! awww love him! such an elephant fan. 🙂 great job. Your first sketch shows the framework of an artist who has something to say. Sketching and making it look easy just isn’t. Your talent is evident with the first piece. Looking forward to what you have next. wow, very impressive for your first sketch! Isn’t funny when you find old artwork from when you were younger? Sometimes I’ll come across things I forgot that even existed!